Garlic Butter Herb Prime Rib Roast is the perfect Christmas lunch or dinner, full of flavour and ready in under one hour! Your family, friends or guests in general are going to fall in love with this beautiful piece of meat! Especially when a buttery, garlicky herb mixture cooks onto and into this meat, which creates a crispy golden crust on the outside, while the inside stays tender and juicy. Prime rib can be sold bone-in or boneless, however a bone-in roast yields the best results if you’re looking forward to guaranteed juicy, succulent meat. A prime rib roast, (also known as a standing rib roast), is cut from the back of the upper rib section and usually has a total of seven ribs. To cook our Prime Rib recipe, you’ll need a 4-bone rib roast. Prime rib may be an expensive cut, but it is well worth the price when feeding your guests around a dinner table. It’s a naturally tender and juicy cut of meat that melts in your mouth! You won’t be disappointed with. Remove your prime rib about 30 minutes before cooking to take the chill out. Preheat your oven to get it nice and hot before cooking. Place the roast in a cast iron skillet or roasting pan bone-side down. The bones create a natural roasting rack for the meat. Pour the garlic herb butter mixture over the meat, rubbing it into the flesh to coat it well and evenly. Roast uncovered first for that char-grilled coated flavour, and then continue roasting, covered until your roast is cooked to your liking. As you can see, the only way we love ours is medium rare. However, you CAN continue roasting to get it to your own liking and preference. HOW LONG DO YOU COOK A PRIME RIB? When it comes time to cook your roast, it’s best to buy a digital meat thermometer. Whether you use a removable stick thermometer or a probe that stays in the meat while it roasts, a meat thermometer provides complete accuracy and prevents overcooking. Cook the roast for 30 minutes, then reduce the oven temperature to 375°F (190°C). Cover with foil and continue to cook the roast until your meat thermometer reads 110°F (43°C) for rare or 120°F-130°F (48°C – 55°C) for medium. When cooked to your liking, remove the roast from the oven and let it rest for 20 minutes before carving. The roast will continue to cook as the juices settle. For an easy Christmas lunch or dinner, serve this Garlic Herb Prime Rib Roast with these delicious sides! The BEST Prime Rib you could serve to your family! Easy to carve with PERFECT results every.single.time! Garlic Butter Herb Prime Rib is the perfect Christmas dinner, full of flavour and ready in under one hour! 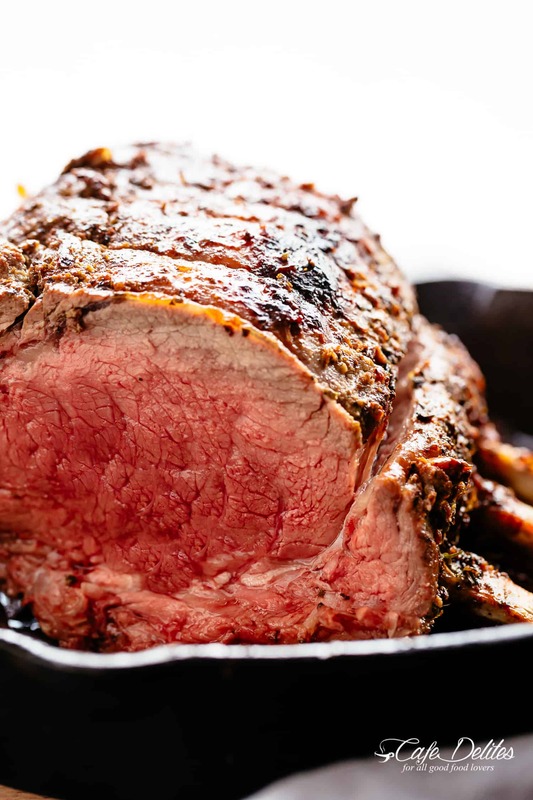 Preheat your oven to 450˚F | 230°C for at least 30 minutes while the prime rib comes to room temperature. Mix together the butter, garlic, herbs, 1 tablespoon of salt and the pepper together in a small bowl until combined. Place the roast in a cast iron skillet or roasting pan bone-side down. The bones create a natural roasting rack for the meat. Pour the garlic herb butter mixture over the meat, rubbing it into the flesh to coat it well and evenly.Season with a little extra salt and pepper for added flavour. Cook the roast for 30 minutes, then reduce the oven temperature to 375°F | 190°C. Cover with foil and continue to cook the roast to your preference of doneness (until your meat thermometer reads 110°F | 43°C). For the pictured roast, we cooked it for 45 minutes, covered. Once cooked to your liking, allow to rest for 20 minutes. The roast will continue to cook as the juices inside settle, raising the internal temperature to 130°F | 55°C for a perfect medium-rare prime rib. *If seasoning your roast the night before, refrigerate the roast uncovered overnight, then allow it come to room temperature for two hours before you put it in the oven. We (my husband, myself, three of our sons that still live at home, 12 cats, and one dog 😛 ) spent Christmas with my second oldest son and his wife and their 7 month old baby boy. I then spent most of last night over the toilet from what I am guessing was bad liver in my much loved Rumaki recipe, lol. It may be a while before I eat liver again. Nonetheless, Christmas was wonderful. 🙂 I hope yours was as well! On a side note, I wish I had seen this recipe earlier! we splurged on a prime rib and I would have loved to try this quicker cooking method! I spent my Christmas with my husband and his children and our grandchild. He turned one this December. I also talked to my daughter on the phone. She moved out of state and I got to see her growing belly by picture. I’ll have another grandchild in May. I spent my Christmas with my sister and her family for the first time in many years. It was a laid back time with lots of games, laughter, love, good food, good drinks and best of all, great company!! It is the best Christmas I have had in quite a few years! My Mom, Dad and Brother have all passed on and she and I are the only ones left. It was wonderful to feel like a family again. OMG! This was the BEST and easiest Recipe for Prime Rib! Followed the recipe exactly and would not change a thing. Here in Texas we are fortunate to have some of the best beef restaurants in the country and this recipe rivals the best of them! My husband went nuts through each and every bite! (in a gr8 way!) Thank you. Hi Susan! I’m so happy to hear that! Merry Christmas! Snuggling with my babies and husband and hoping to try this recipe. Happy Holidays! Merry Christmas!! We are spending our Christmas this year with all of the family on Christmas Eve and Christmas Day (yes I know the wife and I are nuts!) One of the dishes for dinner is the Prime Rib! Thanks Cafe Delites for all of the yummy recipes all year round!! Merry Christmas and a Happy New Year!!! That sounds great! I hope you enjoy our prime rib, Merry Christmas to you guys too! This prime rib is making my mouth water! We are on the water as I type! We are taking our boat from Morehead City, NC to Florida (House is still a mess since Hurricane) so we hit the water! Water soothes the soul! You and your family will definitely love our prime rib recipe, travel safe and Merry Christmas! I have sons and their first question EVERY morning is what are you making tonight for dinner? This is because I’m usually making one of your recipes and they LOVE everything I make, thank you! That’s so good to hear I’m glad your sons love these recipes it’s my pleasure! Happy holidays to you guys! I am so sorry to hear about that, thank you for sharing. I hope you enjoy our recipes! Happy holidays! This recipe brought a tear to my eye. I was a caregiver. I took care of an amazing lady who broke her neck previously for 5.5 years. We became close friends during my time working for her. She just passed away October 11, 2018. She was a foodie. Her favorite meal was beef and potatoes. I made prime rib for her last holidays and she loved it. I know she would have loved this recipe a whole lot! Hope to make this recipe for New Years. Happy Holidays to everyone. Hi Mark, it is so wonderful to hear that she would have loved this recipe. I am so sorry to hear about your story but thank you for sharing it with us it is deeply appreciated. I hope you enjoy this recipe for New Years and happy holidays to you too! Made this prime rib for dinner tonight and it was delicious! My Christmas will be celebrated with my four grandchildren and I so looking forward to it! That is wonderful to hear Elizabeth! I’m glad to hear that you enjoyed this prime rib recipe and I hope you and your grandchildren enjoy more recipes like this one! Merry Christmas! I’ve never been brave enough to make a prime rib roast before, but your recipe and thorough instructions have given me the courage to tackle it this year. Thanks for taking me by the hand … have a very Merry Christmas! Hi Olwyn! I am so glad to hear that you are making this recipe despite the intimidation because it really is a favourite! I hope you enjoy it, Merry Christmas to you too! Nothing went right this year. I’m not ready like I usually am. I usually bake tons of cookies and give them all away. Nothing was done on time and even as I wrapped my husbands gifts, just today, I noticed I bought all the wrong sizes! The old me would have gone off the deep end, but somewhere deep within me there is a strange, very strange, calm. I’m just NOT stressing this year. I want to love, forgive, and try to forget the wounds of yesterday. I am blessed with my family and my life. I have the most perfect puppy in the world who I love more than life itself. So for an “A” type personality who wants perfection in everything, and got it in nothing, I’m really good with it. Eating this GREAT Rib Roast tomorrow and being so thankful that I finally realize that “perfect” isn’t what its all cracked up to be. And I still feel GREAT! God Bless you all and Merry Christmas! Hi Sandi, I am sorry that this year didn’t go to plan but there is always next year to look forward to! Regardless of these inconveniences, I hope that you all enjoy your holidays and this prime rib recipe just as much as we do! This recipe looks amazing…can’t wait to try it for NYE. Just a low key Christmas with my hubby. happy holidays! Hi Kimberly, sounds like a plan! Happy holidays to you too! For Christmas, unfortunately I won’t be cooking like i usually do. Instead, ii will be spending it in the hospital prayiing the treatments are working. But thats ok. God as this! Your recipes are wonderful! I’ve liked everything I’ve cooked! This recipe is fantastic! I made this a few months ago before I was diagnosed. Thank you for such a great website! Merry Christmas and Happy New Year! Hi Brenda, I am so sorry you are struggling around this time, it must be so hard to get through. We are grateful that you could share your story with us here as it is very much appreciated. We are blessed that you love everything you have made and to enjoy the rest of your holidays! I will be spending the day with my family and our dogs. I will also be spending part of the day in the kitchen, and one of the items that I will be making is the above recipe. I cannot wait to try it! I have tried many of your recipes and my family has loved them all! So here is to hoping for another hit! 🙂 Merry Christmas everyone! Sounds good Lilia! I hope you and your family enjoy this prime rib recipe just as much as we did! Merry Christmas! I am spending Christmas Day with my twin daughters and their families which includes 4 grandsons. I have made this delicious Prime Rib before, but I’ll be making Beef Wellington and a bacon wrapped Pork Tenderloin. Merry Christmas to you and yours and may 2019 be a wonderful year for you. Hi Sue! That is really good to hear that you enjoyed our prime rib recipe with your family! We hope you all enjoy the rest of your holidays! Hi Karina! This Christmas I will spend in company with my wife and my two babies, twins of 11 months that have me crazy. It’s been a rough year, my husband and I are just spending the day at home. Hi Lynette, I am sorry to hear that your year hasn’t gone to plan but you can always look forward to next year! Spending Christmas with your husband sounds good, happy holidays! Merry Christmas to you and your Karina! Prime Rib is our Christmas meal!! We will be staying at our house this year and having a nice meal with our two adult kids. There are no spouses yet, but maybe one day. The hubs has to work so just hanging out cooking most of the day…patiently waiting!! Hi Jill, this sounds like the perfect way to spend Christmas! We hope you enjoy your time and the rest of your holidays! Will be spending the Christmas holiday with my son and grandchildren in CA! Sister and her hubby will also be with us. Hi Sherry, sounds great! Happy holidays! For the first time in a really long time I am spending Christmas with my cousins and godparents. Christmas eve is my younger cousins birthday so we’re having yummy beef Wellington with green beans, mash potato and honey roasted carrots – yum!! For Christmas day our lovely neighbour is doing a late lunch with a traditional Turkey and then formal drinks and games in the evening- I can’t wait for us all to spend this time together as a family. Love them to bits. Hi Lydia, this sounds like the perfect way to spend Christmas; surrounded by family and FOOD! Merry Christmas and happy holidays to you all! Hi Gail, This Christmas menu sounds really good we hope you enjoy! Merry Christmas! Thanks for all the yummy recipes !!! Hi Debra, we are so glad that you and your family enjoy making and eating all of our recipes! Your plan sounds great! We hope you enjoy the rest of your holidays and have a lovely new year! Hi Victoria, we are so glad to hear that you will be making this recipe! It definitely is a favourite! Sending lots of happy Christmas wishes your way! Love your recipes, this year we are doing the traditional Turkey with stuffing, I am having my threee adult children and spouses, along with 4 Grandchildren and my mother who is 90 years young. This Christmas will be a little different as we have lost my daughter in-laws mother this year and my husbands brother so they will definately be missed. I would like to wish you all a very Merry Christmas to you and all your famillies. Hi Karen! We are so happy to hear that you will be spending your Christmas with your family and making a good meal! Sending happy Christmas wishes for you and your family for all your losses. Merry Christmas! We are spending our Christmas quietly at home with friends and family. We are so blessed to be able to be with the ones we hold most dear and be able to share the abundance of a meal and fellowship together. Hi Becky, it is so nice to hear that you are spending your Christmas with your family this year! It truly is a blessing! Sending nothing but happy wishes for this Christmas and for the new year! Merry Christmas to you and yours Karina. I love your recipes and have a ton saved on my phone and have made quite a few. You have a fan in this family. This year my husband stepson and I are driving to see my parents and younger sister who is home for college. It should be a nice time. Hi Tara, we are so happy to hear that this prime rib recipe was a favourite and that you are spending time with your family this year for Christmas! Sending happy Christmas wishes your way! The Garlic Herb Prime Rib looks amazing! This year I’m spending Christmas with family. Baking cookies, making lefsa & eating home made lutefisk are all on the agenda along with a lot of card playing. Sadly, my adult children will not be able to come to my home for the holiday, so I am having brunch with my ex-husband’s cousins, whom I got in the divorce. 🙂 I’m having Christmas dinner at a dear friend’s home. This year, I had three breast reconstruction surgeries, my son graduated college, and my daughter got married, so it was quite a year. I have cooked a number of your recipes, especially the tortellini soup, this year, and crock pot meals were key to keeping up my energy and nourishing my healing body. Thank you for your time and expertise! Hi Christine, we hope you enjoy your Christmas! It is nice to hear that you enjoy our recipes just as much as we do! Thank you for supporting our site, sending nothing but happy wishes your way! Happy holidays! Karina, I hope you have a wonderful and happy Christmas. You have been so great to share excellent recipes for us. Our Christmas Day will be quiet as we just had our family dinner and gifts last evening as our 2 granddaughters are in the medical field and have to work Christmas Day. I have fixed Prime Rib many times, but will try your recipe for New Years. Thank you Terri! We hope you and your family have a wonderful Christmas and new year! I hope you enjoy this prime rib recipe just as much as we did! This prime rib looks wonderful. We are having a different Christmas this year. Very quiet.My sister was going to host this year but got sick and had to cancel yesterday. So after going to Mass tomorrow morning my husband and I will have a quiet day together. I’m looking forward to it as it will give me time to reflect on the past year and the one ahead. Hi Ann we hope you have a very Merry Christmas this year and that you enjoy the rest of your holidays with your family! Love your recipes, but not cooking for Christmas this year.. When it’s just the two of us, my husband insists we go out for Chinese. I wish you a very Merry Christmas and a wonderful year of providing your subscribers with the best recipes ever. Thank you. Thank you Gail! We appreciate your support and wish you as Merry Christmas! We have a small but close-knit family and usually spend the holidays at each other’s home. 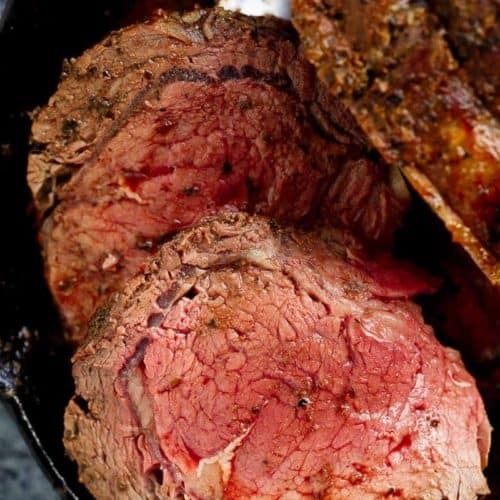 Prime rib is the meal of choice on Christmas Eve and this recipe looks divine. For starters, I make a broiled spicy shrimp, then serve the beef with yorkshire pudding, twice baked loaded potatoes, brussel sprout casserole and salad. Yule log and Christmas cookies for dessert. Happy Holidays! Hi Pam we hope you and your family enjoy this prime rib recipe! Merry Christmas your menu sounds DELICIOUS! First of all thank you for all that you do and I’m not kidding but your recipes are amazing I have tried many of them since I started following you this year and all of my dishes are super amazing! For Christmas our family gathers together at my moms house we have our traditional tamales. We have a craft with the lil ones and read a book about Jesus the true meaning of Christmas. My mom makes lots of desserts and I make homemade chocolate. After we open gifts we play board games, have coffee with dessert and sit at the table talking for hours while the kids play with their toys. It’s a simple tradition yet so meaningful. Be blessed Karina and enjoy your Christmas with your family. Thank you for all you do! Thank you Christine! We appreciate your support and we love that you love our recipes! We hope you have the best Christmas you can and spend it with your family, I am blessed with mine and we thank you for sharing your Christmas plans! Happy holidays! Love your recipes! With my youngest son on travel this holiday, my oldest and his girlfriend will arrive on 12/26 with your prime rib dinner to celebrate Christmas! Thank you for your great recipes. Keep them coming in the New Year. God bless and have a wonderful Christmas. Having family Christmas at my dads an hour away. He found a 39.8 pound Turkey just barely fits in the oven! Looks like we will try this amazing prime rib for New Year’s. Merry Christmas! We will have Christmas Eve dinner with our children and grandchildren at my son’s home! Tomorrow, my dear husband and I will have eggs benedict and mimosas after exchanging gifts at our home! Merry Christmas and Happy Holiday to you and your family! We will use your prime rib recipe to celebrate my husband’s retirement !! This looks wonderful. Christmas is spent with my husband, two sons and twi granddaughters. Presents dinner and enjoying our time together. Oh yes and our dog too. You recipes are amazing! Thanks. We are going to our faughter’s for dinner for Chrysler but we always have prime rib for my husband’s birthday on the 30th so I am going to follow this prime rib recipe. I’m in love with this recipe…. all of your recipes in fact. I’m making a few of the sides…. fingers crossed they’re as dope as the photos lol. On Christmas I’ll be joining friends to dine then coming home to overindulge in several NBA games with my feet elevated and my appetite satiated. Happy Holidays to you!!!! We spend Christmas with my in-laws. Then we will drive 3 hours north and spend Boxing Day with my family where we will be having this!!! There will be lots of sledding and skating and lights viewings. Jammed packed days filled with family fun! With my beautiful little family here in sunny Florida! Celebrating Jesus! I will be having a warm Christmas with family, being grateful and reflecting over the past year. Merry Christmas! Christmas Eve will be a joyous bundle of craziness with my daughter’s in-laws and extended family then Christmas day is filled with a bit more loving insanity with all of my kids and grandkids. Loud, messy and sometimes nuts but the day of the year with all my family, great food and lots of love. I will be spending Christmas Day with my family, including my first Granddaughter! and then Boxing Day with my extended family, including my sister and her family travelling from Quebec, to feast at my parent’s home. I will be spending Christmas with my 3 sons 🙂 Thank you for sharing all these delicious recipes!! Merry Christmas and Happy new year! I will be having the same traditional Christmas I have celebrated for 73 years. Christmas dinner with tenderloin beef, potatoes, salad, and as many Norwegian cookies I can eat. My family will be included and I will again see Christmas through the eyes of a child, my granddaughter. I love your recipes Karina, thank you so much. I wish you and yours a very Merry Christmas and a wonderful New Year. We will be celebrating with family members, sitting around the fire to open packages, and then enjoying this delicious prime rib recipe. We have used this recipe before and it is definitely a keeper! This year we are spending Xmas with our son from New Zealand. We are cooking your beautiful prime rib recipe. Merry Christmas and many blessings for the New Year. Keep posting your delicious recipes. Thank you for your wonderful recipes, I enjoy them so much. I pray everyone has a wonderful holiday. I am spending it with my elderly mother this year, not sure how many more we have but want to wnjoy and make the most of it while we can. Merry Christmas and Happy New Year! Will be spending Christmas with all of our relatives, I will be cooking for 17 on Christmas Day and 22 on Boxing Day. There will be lots of fun, games and laughter. We lost our dear dear grandad earlier this year so I think there will be some tears and quiet remembrance times also, he is very much missed by all, especially his wife and our loving gran, they were married for 63 1/2 years. Hi Jemma, we hope you are well prepared for so many guests! So sorry to hear about your grandad, he will always be with you and your family. I hope you enjoy your Christmas and the rest of your holidays! I am past my 3/4 mark in my journey to be one of the Centenarian Elites and most of my family is already gone and the small number which is left do not find it convenient to communicate with me so I will be spending a very quiet Christmas at home with my faithful chocolate lab and the open sea at my front door. I don’t have a full kitchen so my culinary preparations are quite limited at present. [You can only do so much with a single burner hotplate and a toaster oven] But I still read your email daily and save those recipes which I can manage either in my small kitchenette or on my deck on the Weber kettle. I want to wish you the most pleasant holiday season filled with joy and the love of family and dear friends. My best friends, here in Florida, visited yesterday [Sunday], and we had a very enjoyable day filled with sunshine and a wonderful fresh catch seafood dinner at our favorite local seafood restaurant. I was so glad to see them and we got caught up on all the “news” since I visited them over Thanksgiving. They are my family now and I love them dearly. May you have your life filled with abundance and with happiness in this coming new year. I look forward to more exploring of my area via kayak and “road trips” and will, as I do with each and every one of my adventures, record all of my new sights and beautiful scenes with my faithful EOS digital camera. It has been one of my lifelong hobbies and I find much peace and enjoyment in my personal connection with “Mother Nature”, [some call Her God], and I hope you will find bounty in the simplest things in your life also. Afterall, it is the simple things in life which become the lasting memories from which we all draw our strength to venture further on down that path we are on. Take care and stay well. Quiet Christmas for our family this year. It has been a wonderful year to be thankful for and a difficult year for family and friends as well. Christmas Eve is pot luck with my son and daughter in laws family. Christmas Day will be pot luck with my daughter who is home from college and my new husband. Also joining us will be my best friend of 50 years along with her husband and sister. We adopted a new tradition as of last year. No more gifts or expensive cards. We now celebrate time together and wonderful conversation. We plan time to be spent together in the coming year. It is so pleasurable and stress free. After seeing this recipe my plan is to make this and have a special family dinner between Christmas and and when my daughter leaves to goes back to college. We don’t celebrate New Years as my husband lost his entire family in an apartment house fire on New Year’s Eve when he was 12. I so enjoy your recipes. I now have a recipe ap that makes it so easy for me to save recipes. Thank you for sharing such wonderful recipes. My husband and I are celebrating Christmas at home. Our families live too far away for us to travel for a visit so we will cook a roast beef with mashed potatos and green beans for our meal. We will do our visiting via skype. Merry Christmas to all. I will be spending Christmas with my loved ones coming to my house. I can’t wait to see the grandchildren! This looks delicious, and better yet, easy to make. I’m going to save this for a future Sunday dinner. If I had time to run to the store, I’d make it this weekend, but I have to prep for Christmas Day dinner, which I will be spending with friends. I’ll be spending Christmas with my husband and my twin 7-year olds girls. I’ve invited the grandparents over for the day so the kids can enjoy playing with their presents at home. This Christmas I’m travelling to my elderly parents home and making them Christmas dinner that we can enjoy together with my kids. Of course I have 3 of my favourite Cafe Delites recipes with me so I can make the dinner extra wonderful – cheesy bacon Brussel sprouts, cream of mushroom soup, and juicy beef tenderloin. Thank you so much for sharing such incredible recipes – they’re succulent, delicious and easy to prepare. Merry Christmas to you all!! We will be spending Christmas with family as we celebrate my mother-in-law’s last Christmas at the palliative care unit. Food has always been the central point of our family celebrations, especially at Christmas time!Thank you for sharing your passion with many of us from around the world. BTW…the prime roast looks amazing! I will be having all of my children and grandchildren here at my home tonight. Always a chaotic, wonderful time. Tomorrow I will be going to my brother’s for Christmas dinner with his family. Your recipes are amazing ! I’ve never made prime rib but it would be a first for our family and a huge hit! For Christmas dinner . One of my favorite things is Prime Rib and your recipes are so easy to follow and I must say, everything I’ve made has come out fantastic following your instructions and because of that I’m going to try making it myself. Your recipes are the BEST and I don’t use any others now because I KNOW it will be good if it’s one of yours. You make it easy to be a good cook! THANK YOU and Merry Christmas! My husbands mother passed away 10 years ago. As a kid his mom always prepared a prime rib roast on Christmas day. We now have a family of our own and every Christmas, he prepares his mom’s prime rib roast recipe with mashed potatoes and a broccoli cheese onion ring casserole that his mom created. I was never a huge fan of prime rib and every year I want to do something different, but I know he looks forward to it. This year my husband has to work starting at 5:00 pm. But he is still planning on preparing his mom’s “famous” prime rib dinner for all of our guests. I told him not to go through the trouble, it takes a long time to prepare. But his response was “It’s like she is in the kitchen with me and I wait all year for this day so I can be with her.” I will never complain about wanting to change our Christmas dinner menu ever again. It’s just my husband and me and we’ll be having his favourite meal for Christmas dinner — meatloaf, cauliflower mash, and green beans, with apple pie for dessert. I’d rather have the prime rib! I am spending Christmas at home. My wife suffers severe depression, so we don’t go anywhere on most days, and we don’t have family down here in Georgia. I will probably just fix some turkey or chicken thighs for myself (wife is also a vegetarian, and I am not), but that is alright. Christmas is a time to contemplate where you are in life and despite the issues, I believe we are both in a relatively good frame of mind. Karina, This looks so good! Thanks for this recipe! I’m baking a sopapilla cheesecake to bring to my in-laws (my go-to) and making a swedish apple pie for my mom. That was my nana’s go to, and then my mom’s, and now mine. I am honored to be able to carry on tradition through baking!! Happy holidays to all!! My Christmas will be sharing breakfast with my daughter, son-in-law and grandson. Followed by a movie at the theatre with my son and his fiancé. Then out to Christmas dinner. It will be a blessed time with family and I am so looking forward to it 🙂 Merry Christmas everyone! I’m spending Christmas with my family. I want to thank you for sharing all of your wonderful recipes. My family and I have really enjoyed them. Wowza! That prime rib looks amazing. For the holidays, I have 12 adults coming over to my house and will be cooking my Jack Daniels Ham for all! Each year we are given another opportunity to renew our Christmas Spirit and nourish our souls for th New Year. Due to medical reasons , my husband & I will be spending Christmas alone…but busy on the phone with family & friends.Instead of Prime Rib we are having prime roasted steak with shrimp, creamy cauliflower mashed potatoes, & roasted Brussel sprouts. Merry Chistmas & a Blessed New Year! I will be spending my Christmas with my husband and son with a simple meal feeling thankful for this peaceful Christmas. Honestly, this Christmas is new for me. I’ve spent the last 8 years traveling to different states between my mother and fathers house for the holidays (divorced parents). I loved the idea of my family coming together, no matter the costs. In the last 3 years, I have gotten married and had a baby. This year, I’m learning how to embrace my new immediate family, create new traditions, and spending a quiet Christmas at home is how we’ll spend our holiday. I’m a PhD student (graduating next year!!! Thank God!) and I’m learning how to move forward rather than holding on to the past. So, I’m excited! My one year old will learn what Christmas is about— family! I’ll bake cookies, use some of your recipes (of course the prime rib) for our Christmas dinner, and enjoy a close knit Christmas Holiday Celebration. Thank you for the opportunity to share! I hope I win the gift card! Thanks for the opportunity. The roast looks yummy! I think I will be fixing that for New Years instead of the traditional pork dish. For our family Christmas get together we have a buffet. The host supplies the meat (baked ham) and drinks. The rest of the folks supply the rest of the food. I’m bringing a cranberry and chocolate pull-a-part bread. Others will bring Mac and Cheese, Veggies, tasty apps and of course dessert! First and foremost attending Christmas Eve church services, then enjoying time with the grandkids and relaxing after all the hustle and bustle of the season. Love your site – amazing recipes! The prime ribs looks delicious. Will be trying that for Easter. But today I will be working and half a day tomorrow, law enforcement never sleeps. But my youngest son and I will be making scallop potatoes, with a homemade cheese sauce, collard greens, dressing and turkey gravy, sweet potatoes, apple pie, a coconut pie, grilled corn and barbecue ribs and chicken. Both my two older sons and their family’s will be joining me and my younger son. Can’t wait. Happy holidays to everyone. I’m currently cooking the roast pork for the last Xmas dinner my youngest son will be having with me before he moves out of home to start a new life for himself with his lovely girlfriend. It will be a happy day tinged with a bit of sadness at his leaving home but full of hope for their future life together. As the weather will be hot hot hot, we will be having a cold lunch of pork, chicken, prawns, various salads finished off with a homemade rum & raisin ice cream slice. Merry Christmas to all & a very Happy New Year. Hi Katrina, great timing on this recipe. I have some friends coming from upstate that visiting and dining with us prior to joining their family for Christmas. With everything else that needs to be done.. I may try this on the grill. At our house we will be celebrating on Christmas Eve this year with my daughter, hubby and the two teenagers. It will be a first to wear Christmas PJ’s, having a hot chocolate station, posing in a photo op frame with additional Xmas props and we will also play games. Oh, and I forgot that somewhere amongst those activities we will open gifts and have a quick meal of lasagna, salad. Merry Christmas everyone!🎄🎄🎅🏻🎄🎄. My prime rib is in the freezer and will be cooked for a special January meal. I WILL be using this recipe as it sounds perfect! I am doing a roast pork with cracking cooked on a spit, bolar beef cooked on kettle barbeque, potato bake in the oven, fried rice in a wok. 30+ family and friends for Christmas lunch. Christmas will start with midnight mass followed by a party for the members of our Scola choir hosted by my daughter and son-in-law. After going home for a few hours sleep, we will be taking our traditional Christmas breakfast over to our friends’ house (the husband now has health issues and can’t make the trip, so we are taking the breakfast over to them). Around 1:00, we will be heading back over to my daughter and son-in-law’s home to celebrate Christmas with our granddaughters, our daughter and son-in-law, and his parents and older brother. Every Christmas I look forward to cooking up a feast for my parents. It’s a time when we reminisce about the year and old times. Brings such warmth to my heart. This year I will be making Gordon Ramsay’s braised beef short ribs, Roast Chicken, Crackling Roast pork Belly. Merry Christmas! It will be quiet here in my house since there are no children. My son has a co worker who will be spending the day alone so he is trying to get her to come to our home for Christmas dinner which this year will be Chicken Parmesan with pasta and garlic bread. Praying she comes over. I also have a present set aside for her so she will have something to open. After all, this is the for giving (but I try to do this all year). Wishing all the best New Year! I make a prime rib dinner every Christmas. My family gathers at noon to open presents and then we eat around 2. It will be a fabulous day. Merry Christmas to all. I will be spending the day cooking for elderly relatives who are traditionalists and like their Turkey dinners on Christmas Day. However at some point over the holiday period, maybe when we have our traditional family day with our three meat loving grandchildren on New Year’s Day I hope to be cooking your prime rib roast and garlic scalloped potatoes. These recipes look tremendous. I have cooked many of your recipes over the past year, some on several occasions and have loved them all. Merry Christmas and I look forward to more recipes in 2019. This year we are travelling so my mother can’t make our proper Brazilian tradition Christmas dinner. I am in a little city called Mutters, located in the middle of a mountain in Austria. We are hoping to finally see snow and have a real Christmas winter as in Brazil it’s 34°C. We are having Christmas dinner at the hotel at night which we have not seen the menu for but are anxiously awaiting with much curiosity. Merry Christmas!!! I am definitely making this recipe and spending Christmas dinner with my daughter, good friends and boyfriend. Happy holidays to everyone!!! I am making roasted Cornish game hens for Christmas dinner. The Prime Rib is a bit too expensive for me. Have a merry Christmas. This is what we are having for our Christmas dinner – the first one in our new home! We were debating on prime rib or ham but this recipe made the decision for us! Thanks for all the wonderful recipes you have shared! Merry Christmas! I am going to make this for Christmas dinner…I am having it with my son and his wife. Last year I almost died…so happy to enjoy my world now! I am so much healthier…You can eat good food with portion control! Thanks for all the great recipes you bring to my email! Yum…..love this recipe. Our family will gather at my home on Christmas Eve for food and gift exchange. As with every year, my son and i will be spending xmas with just the two of us. We have no other family. We keep to ourselves and have no -one else to share the season with except each other. I could wish for no better person to spend any day with ! Hi, this recipe does look really good and I look forward to trying it someday. I’m usually not a big fan of prime rib anymore, ever since I was served some that was extremely under-cooked and I got sick, but I might try it again since I’ll be the one doing the cooking, or I might try it with a different cut of meat. This Christmas, I’m not planning on doing much at all. My mom is taking me out to dinner tonight, but I’m not much in the mood. My husband, after being together for 21 years, died unexpectedly this past April, so this is my first Christmas in 21 years I’m without him. We never had any kids, so it’s just me, my two dogs and two cats. I also just had my 16th spine surgery, so I’m still healing, plus it was my first surgery, ever, I didn’t have my husband here to help me. I’m hoping 2019 brings a little more sunshine than 2018. Ill be preparing both Christmas Eve and Christmas Day dinners this year with my husband and our four boys (girlfriends included of course). Christmas Eve will be your creamy garlic Tuscan salmon and Christmas Day will be your prime rib roast! I Should be so lucky it turns out as well as yours, fingers crossed! Being far from my home town, being far from my family and working in a place where they didn’t celebrate Christmas was a hard one. Making our Christmas eve a little sad. Good thing I now have a husband to celebrate with. Planning to celebrate it 1. With a grateful heart thanking God for giving us a salvation money can’t BUY-Through JESUS. 2. To have a simple dinner with my husband, enjoying life. 3. Video call to our family way back home in the Philippines, so that even in that way we can celebrate together.. Far away physically but not in our hearts..
Have a wonderful and meaningful Christmas to all of us..
We usually have 2 gatherings around Christmas because our kids have their own families and it’s hard to coordinate everyone to get together. This year it’s even harder and we are having 3 gatherings. We are missing my dad this year as he passed earlier in the year so this is our first Christmas without him, so we are grateful to even be able to spend time with our kids at all. Another winning recipe – my whole Christmas feast comes from your amazing website – thank you!! This prime rib recipe was fantastic. Made this two days ago for my daughter and her buddies since kindergarten. This has been an annual gathering since the kids were in high school over ten years ago. They all loved the beef! Today I am cooking your Beef Tenderloin for my family and friends along with the Garlic Parmesan Browned Butter Mashed Potatoes. I’m pretty sure this will be a hit as well. Thank you for all the wonderful recipies! This looks fantastic. We will be spending Christmas morning with my husband’s mother who is 93. She is looking forward to our homemade cinnamon rolls! Later in the day we will visit with my sister and her family. We’ll be spending Christmas Eve with our daughter and son-in-law, our grandson and his wife and kids, and our granddaughter and her kids. Right now we have 4 great grandsons with a 5th one due to arrive any day! There’s nothing better than having 4 generations all together to celebrate the wonder that is Christmas! Oh and BTW, Prime Rib is on the menu! We were supposed to be spending Christmas Eve at my mother in law’s and my grandmother was supposed to come up to go with us, but BOTH the 2 and 4 year old are sick, one with respiratory, one with vomiting, so we are stuck at home. What’s worse is hubby is a firefighter and on shift Christmas day so without my gma coming up, it will just be the kids and I watching My Little Pony or Disney. Not my ideal holiday but we’ll manage and be thankful for all that we are blessed with and pray that good health is added to our list soon. I did pick up 2 rib roasts on sale so I will definitely have to give this recipe a try! Thanks for sharing and I hope you and yours have a fabulously blessed holiday! I’ll be hosting a lunch for my kids and grandkids and a dinner for our neighbors who are alone this year on Christmas! Being together is the very best Christmas gift of all! I will be hosting most of my family that lives here at my house this year. We are not having a traditional dinner; we are having finger food; ham, rolls, summer ssusage, cheese, olives, pickles, chips, crackers, dip, Bruschetta and desserts! I can promise one thing; after the holidays I am getting a prime rib and using this recipe! Merry Christmas to you and yours! I’ll be spending this Christmas Day with my partner, who I reunited with a little over a year ago after 5 years of being broken up (after a 5 year long relationship). I’m excited because I haven’t seen my sister in a year and it will be a great day! I love your recipes and collect them all! We are hosting my inlaws for Xmas Eve and then Christmas day will just be the 4 of us (my husband, our two boys, and I). It’s just my husband and me this Christmas. Most of our family is up North. At least I don’t have to work this year! Christmas will be a joyful celebration of family, food and good conversation. Happy Holiday to all of the people on Karina’s site. This recipe looks fabulous and it’s what I’ve been making for my family every Christmas Day Dinner. Sadly, this is my first Christmas after my divorce of 21 years. And as we won’t be the family as we once were to celebrate the holidays, and traditions that we had are gone…one of the absolute promises my kids asked me to keep was even though we might be all separated that day, to make my traditional Christmas Prime Rib with my hollandaise and mustard sauce. It’s almost true comfort food! I’m desperate for a bite just thinking about the meal. Thank you for your wonderful recipes this Holiday season. It’s has definitely kept me preoccupied. Merry Christmas! I will be spending Christmas surrounded by family enjoying treasured family recipes. 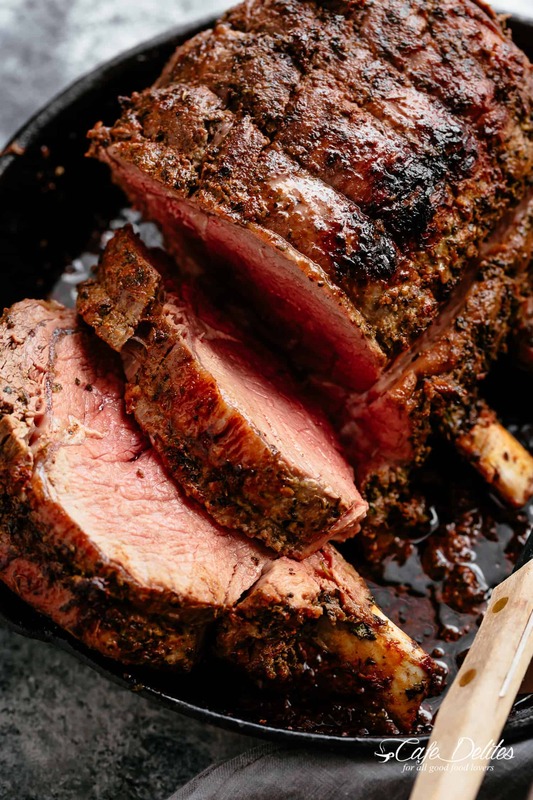 This rib roast recipe looks like it needs to be added to our menu. Delicious! Happy holidays, everyone! A friend makes wonderful prime rib. I will share this recipe with her. I was invited to spend Christmas morning with her family. Then it will be off to work for the rest of Christmas Day. Spending Christmas with our children and grandchildren. First time in two years that we are all together again. So wonderful. We will be having a small family dinner enjoying this delicious prime rib. My daughter, son-in-law and grandchildren are coming to visit me and my other daughter, son-in-law and grandchild this year. So happy to be together. I don’t have to do any cooking this year! My son-in-laws are great cooks and are preparing the Christmas dinner. Can’t wait to see what they have come up with. We will be spending Christmas Eve with my side of the family. We are Cuban so we are roasting a whole pork in “la caja china” not sure how that translates to English! Lol! We will also have moros (rice and black beans) and yuca with mojo. It will be a traditional Cuban “Noche Buena”! We look forward to this festivities and spending time with our family. On Christmas Day we go to my sisters house and eat the left over por with Cuban bread (pan con lechón) and the kids run around and play with all of their new toys and gadgets! Always a memorable time in which we create great family memories! I love Prime Rib and have always been a bit afraid to try cooking it at home. Thank you for the recipe, I will need to try it. Merry Christmas! We always have Crab Cioppino on Christmas Eve at my aunts house and we open all our presents. On Christmas morning the kids open their presents from Santa and then we go over to my aunts again for food and games. I will be spending Christmas Eve with my side of the family, nothing beats a Polish Christmas with peirogi and keilbasa! Christmas Morning will be with my wife’s family opening presents and we will be wrapping up Christmas at my brother’s mother in law’s house! Full Christmas circuit! My Christmas will be spent with my husband, my daughter and my 96- year-old father. Daddy is very excited about being with us this Christmas since he spent last Christmas in the hospital. I’m making a breakfast casserole (hash browns, sausage, eggs and cheese) and a prime rib for dinner. My roast is 5.65 pounds and your recipe sounds perfect (we all love garlic). Merry Christmas Karina and thank you! Christmas Eve I’ll be prepping a Sirloin Roast using this recipe for Christmas dinner. I’ll will put the garlic, butter and herbs all over it and let it sit for 24 hours before I roast it. Should help to tenderize it a bit and make it very flavorful. I have a greenhouse full of fresh herbs to use for this recipe! It will just be my husband and myself and our neighbor, Dennis. Our children all have their plans this year and our neighbor’s kids live out of state. So it will be a quiet dinner with just us three…..going to make garlic mashed potatoes, a broccoli casserole, fruit salad and pumpkin pie for dessert. We’ll probably watch one of our favorite movies, maybe break out one of the old board games from up in the closet and enjoy each other’s company. We’ll miss the kids and grand kiddos; watching them open their gifts and seeing the excitement on their faces. We’ll look forward to their phone calls and we’ll have to wait for them to send us the pictures of their festivities to see those smiling faces we love…….Hope everyone has a Blessed Christmas and a wonderful New Year! This recipe looks delicious. Maybe next Christmas we can try something different. Usually the family gets together for dinner & we have ham & turkey. It might be time to change it up a bit. Having quiet meal with family and hanging out! I normally do rib roast for Christmas, but this is a different Christmas in every way. I brought my hubby home from a three month stay at a nursing home and hospice is starting after the holidays. Our last Christmas meal will be fillet mignion , Lobster, and twice backed potatoes with cheesecake for dessert. ❤️ I’m so glad we are together. Just enjoying our time and watching our favorite movies. Thank you for the recipe! We had purchased prime rib, so really looking forward to making this for our family get together over at my parent’s house. Happy Holidays! I’ll be spending Christmas Eve with family, but we are staying in for a cozy rib roast dinner on Christmas. Planning to try this recipe. Your email arrived just at the right moment. Having bravely dared to cook Mexican food for Christmas dinner one year, I am now expected to do the same every year. Therefore, I will be trying to get all that goodness on the table by 2:00 pm (which is a running joke in my family because I never make that deadline); during which, as families do, we will go through the “remember when” stories. On to exchanging gifts and playing one-upmanship on football stats and who will win the Super Bowl. I’m spending Christmas with my family. We are having sweet potato soup (a family tradition), ham and lots of cookies. i am cooking xmas dinner for my son and soon to be fiance. this will be fun time spending time with my family. i look forward to cooking our traditional xmas dinner.there will just be the 3 of us my oldest son cant make for xmas . On Christmas eve my sister in So Carolina and I (in Massachusetts) will Skype with my daughter, son-in-law, and 20-month-old grandson in Australia. What’s more fun than watching a child open gifts! Then, Christmas day my brother and I will visit friends and come back here for eggnog and brandy. Merry Christmas to all. I will be spending my Christmas and New Year working, My family will be in my heart though. I will make calls to let them know i miss them and thinking about them. Hi we will be spending Christmas at home. When I was younger we rarely visited anyone we stayed home to celebrate this beautiful holiday season. Your receipes bring back so many good memories of Christmas when my parents were still living. This year we will be making a prime rib. Spending Christmas my entire family. This roast looks great! But now I live in Ukraine and Christmas is not until January 7th…not only that…beef is pretty scarce here…so no Prime Rib for me 🙁 And…..Merry Christmas everyone!!! As empty nesters, it seems more often than not,!our kids and Grandkids can’t be “home” for Christmas. The past couple of years, we have gone to a movie on Christmas Day. I often make a filet roast for dinner, but we’ve also had just appetizers OR found someplace that’s open on Christmas evening for dinner! I miss the days of kids and extended family in town! I can’t wait to try that prime rib!! Yum! Thank you! So enjoy this blog! Celebrating the birth of our Savior with family and enjoying food and our precious time together. traditional in Hawaii from where we all moved to here in southern Oregon. We are having a simple family gathering for our Christmas. My parents live in town and will join us and my son, who lives about 1 1/2 hour drive away, came down for his Christmas vacation. My daughter and her family are stationed at Aviano AFB, so we will have to Skype with them. We will sit around and talk, eat too much, possibly drink too much, and just have a good time. Since we are planning on having a rib roast this year, this will be the perfect recipe for our Christmas dinner. It looks amazing! I’m a widow who will be spending Christmas alone. However, I am cooking a ham and will be watching some Christmas movies. Hopefully I will be able to afford to get a kitten to share my home soon. I’ll be spending the holiday with my husband and our 2 girls minus our oldest son who just moved away to California and we’re in Texas. It’ll be different, but we still have our girls at home. I’m off from my retail job, so I’ll be baking cookies and just enjoying family time! My daughter and son in law are spending Christmas with his parents in Nebraska so we exchanged gifts and had Christmas dinner early. The drove around town to see Christmas lights. Luckily it was cold that night because South Texas usually is hot or warm and we have to drive with the air conditioner on to get the winter effect. They drove from Texas there and just got there today. We will spend Christmas Eve with my husband’s family playing white elephant and having Christmas dinner. This will be the third Christmas without my father in law who passed, so we will be with my mother in law and my sisters in law and their families. Then my birthday will be five days later so off to Grimaldi’s for birthday pizza for lunch and then to Cheddars for my favorite bourbon glazed Salmom for birthday dinner. It is a tradition now . Merry Christmas and Happy New Year! Spending time cooking and baking for friends and family. I love to cook! Christmas Eve I go to my daughters house and spend the night with her family so I can be there when the grandkids get up on Christmas morning. We say happy birthday to Jesus, open gifts and have a wonderful breakfast, spend the day together and have a delicious dinner. Everyone gets involved with the kids’ new toys! I am blessed! Hi! I’ll be spending my Christmas at home with my husband who will be cooking an amazing feast for me, my 86 years old mom, and step dad. He always outdoes himself. His dinners are amazing, I am spoiled! What is more elegant for a candlelight Christmas dinner with the table set with crystal, China and silver than Katrina’s luscious rib roast! Planning on it for Christmas Eve with the whole family! I shall spend Christmas opening gifts with my grandchildren as it strikes Midnight. Breakfast Buffet at my eldest sisters home ( tradition started by my father) and Dinner at My Home – serving a Pork Roast w/Apple and sage dressing and various specialty dishes cooked by family! Love the Holidays!!! I will be spending Christmas Eve and Christmas Day with my family at my daughter’s. My three children take turns having each holiday. Always a special day. This will be our first Christmas not sharing with family. My husband was diagnosed with a rare form of blood cancer in October of this year. As with many cancers my husbands was found in the late stage, Dr’s gave him 12-18 months. But, they did offer us a potentially life saving treatment of a stem cell or bone marrow transplant. It is a risky procedure and will take many months being away from home and in isolation due to his compromised immune system. So this Christmas its just us, and on Dec 30th, we start the process. We are counting our blessings and praying this transplant will allow us to have many more Christmas’s together with our family. We have made many recipes from CAFE DELIGHTS and always look forward to seeing what’s new. I will be spending Christmas with my mother, sisters, brother and our children. We plan to stuff ourselves with Mexican food, play a round of a white elephant gift exchange, put at least one jigsaw puzzle together and take a walk, weather permitting. Hi Karina! So this Christmas is turning out to be different from what we had planned… Our extended family that was supposed to come visit us isn’t coming, so it’s just two of us. We’re going to have a tropical Christmas dinner this year using your lobster recipe that was sent last week! Pairing it with pilaf, herb roasted fingerling potatoes, grilled asparagus and glazed baby carrots. Oh, and some good crusty bread from our favorite bakery! For dessert, chocolate pecan pie and I am also going to try the Nutella Christmas tree churro you posted a while ago. Thanks for the awesome recipes- please keep them coming! We celebrated with our children and grandchildren on Saturday, and will spend Christmas Eve and Day with the family here in our town. We are spending Christmas with as many of my kids as can make it home. And we’ll be making the prime rib recipe for Christmas dinner! Thanks so much for your recipes- we use many of them. We are spending our Christmas in Missouri with my in-laws. We only come back 1-2 times/year and are enjoying the time to relax and just enjoy the company. It’s so nice to be able to slow down and enjoy the season. This looks like a great recipe and I can’t wait to try it. I love prime rib roasts and this will be the recipe I use on New Years Eve! Looks like I’ll be spending my Christmas in the hospital. Been here a week already, which also included my birthday. Definitely put a damper on the holidays. How will I spend Christmas day? Noshing on three types of meat (turkey, ham, and ribeye roast), along with cheesy riced cauliflower. I’m looking at this recipe for the rib roast. I may be making a few modifications. I’ll be making this Prime Rib for my Daughter for the first time together on Christmas in about 40 some years and Grand-daughter for the first time ever. So exciting. This will be the best Christmas ever. I love this recipe and cooking method. I’m sure it will be an excellent roast. My husband and I divorced three weeks ago. My son and I moved out yesterday and will be spending Christmas Eve cooking for a friend and Christmas morning skyping with my mom and sister. My beautiful son is five and has been incredible throughout this whole adventure of ours. I am so lucky to have him. May family and I are staying home and laying low this holiday season. I am working all week and my husband has the week off. We will have beef tenderloin on Christmas Day for dinner and open presents. I will be spending Christmas with my beautiful daughter Andrea and son in law Nick and my beautiful granddaughter Haidyn 6 and my beautiful grandson Asher 2. We will be having your honey glaze ham. I will be spending Christmas with my husband, son, and a few of our cousins at our house Christmas Day. I’m going to try and make this prime rib recipe. We just made the creamy cauliflower chowder yesterday. It was delicious. Found you on Facebook a few months ago. So glad I did as my family has loved every one of the recipes I’ve made so far. Thanks you so much for all the wonderful recipes. Merry Christmas & Happy New Year! I Will be spending Christmas with my husband’s family. I’ll be spending Christmas as I have for a number of years, with my daughter and now estranged husband (it’s complicated). We’ll have prime rib roast on Christmas Eve and Turkey on Christmas Day. As my mother died this summer, we’ll have fewer guests for Christmas dinner than in past years – just one of my brothers and a family friend. I’ve used a number of your recipes and have recommended some to friends. I haven’t tried this recipe yet. I’ll be with my 92-year-old — and in FANTASTIC shape!! — mom and a friend. We are having prime rib and I’m making your recipe. It sounds fabulous! There is no such thing as too much garlic. 😊 Merry Christmas!! We will spend Christmas eve at my in laws like we do every year. Christmas day will be spent at home, very relaxed so the kids could spend the day enjoying their gifts. Wish I could make this recipe but it’s hard to do for one. I will be spending this Christmas quietly alone. I recently lost my husband of 47 years and feel it will be a good time to reflect on what I am thankful for and wishing the New Year holds hope and happiness for all. Thiss Christmas my motherinlaw is actually making a brisket. I never think about a meal like this for the holidays but its such a great idea! Love your blog! I share SO many of your recipes with my friends. Any plans for a cookbook? It would be perfect to give to friends! I am spending Christmas with the family, but most importantly I am nursing my cat back to health after he almost died from liver disease. We told the kids that we get to have our cat for Christmas this year and that is better than any gift. If we could win the card it would mean the world to me to be able to to get them the Christmas we we’re planning on. Thanks for considering us and having this contest, I thoroughly enjoy your blog and my family loves all the delicious recipes you post! Merry Christmas to you! Hi! I am spending my Christmas with family! All of our cousins, aunts and uncles get together on Christmas Eve. Then Christmas Day we stay home, I make pozole and we watch movies. Now the day after Christmas we go to opening day at Santa Anita race track! Happy Holidays!! I will be spending Christmas with my best friend of 40 plus years and her two girls who are my goddaughters. We will open presents and eat lots of good food! We will be spending our first Christmas as‘retired folks’ skiing and snowshoeing!! I might have to try this Prime Rib recipe – it sounds wonderful! Merry Christmas! I’m a nurse in pre op and I’ll be working this Christmas but plan to make your prime rib roast after work. We celebrate with extended family on Christmas Eve and it will be my kids and husband on Christmas Day. Let’s hope for an uneventful day at work and that everyone stays safe and healthy. Happy holidays! Will be spending Christmas making gingerbread houses, opening presents, and visiting family and friends. It’s going to be a lovely time here in the states. I love your recipes! your recipes are so inspiring and they have helped me cook much better. christmas is with my family and friends. Yummmm! I will be spending Christmas with just my husband and kids! Looking forward to some good family time! Before I share how I am spending this Christmas, I would like to let you know how much I love your daily emails. I have tried many recipes and have never been disappointed! Thank you! I am spending Christmas with my daughter, son-in-law and their 4 month old baby girl. My other daughter will also be with us. This is my first grandchild, so this will be a very special Christmas indeed. We will be attending midnight church service to celebrate the birth of our Savior Jesus Christ. Can’t think of a better way to start Christmas day! My husband loves prime rib so I am planning on trying this for New Year’s day. First off, Merry Christmas! LOVE your recipes. I will be spending Christmas with my family and am making this prime rib, Can’t wait to eat it! 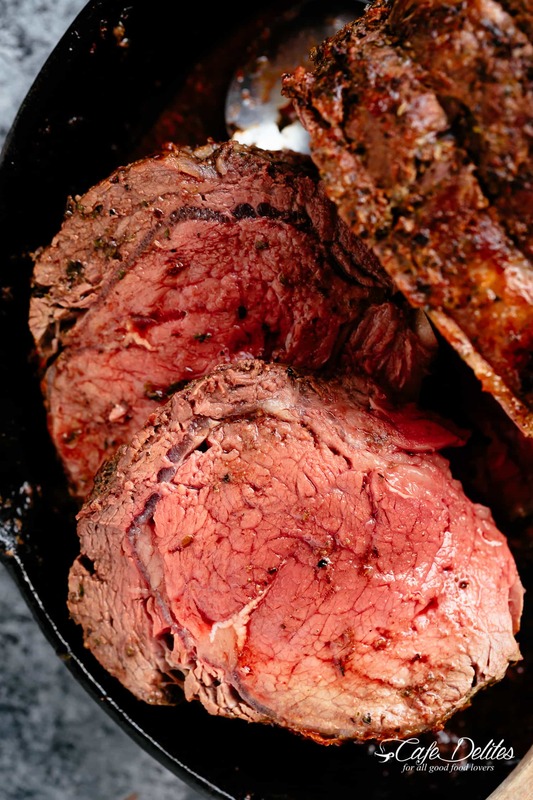 Great tips on how to make the best prime rib, evah! This year my mom has come up to spend Christmas with us. It’s been many years since she has been able too. We have finished last minute shopping now to make one of your delicious recipes! I’ll be celebrating Christmas with my family, lots of love, laughter & memories. And of course lots of delicious food! This year for Christmas re are giving to others in need by fund raising for a local pet rescue, and fixing our neighbor’s furnace who’s husband passed away this summer and splitting a supply of wood for her so she can be warm. Then we are travelling to Asheville to visit our parents who are in their late 80s to spread some cheer! Merry Christmas Karina. For our family it’s been one heck of a year. My husband has serious cardiac issues and even has an internal defibrillator. We spent the better part of September to the beginning of December in and out of hospital with him, with in being more than out. He had two serious operations in less than a month and developed congestive heart failure due to the added strain. We were not sure each time he went in, whether he would come out…but we feel blessed because he did. He walked out holding my hand. He and our son are my strength and my life. We draw strength from each other and hold each other up when the going gets tough. You ask how we will spend our Christmas this year and I’ll tell you it will be a quiet one. We’ve had too much drama this year and just want the enjoyment of each other’s company, good food and drink and possibly a friend or two to drop by to enjoy our fire. Santa has brought a few good games for us to enjoy and hopefully there will be a lot of love and laughter to close 2018 and ring in 2019. From our home to yours, please have a wonderful Christmas and thank you for all your wonderful recipes. Oh My … Yes … Marvelous new suggestion for preparing a PrimeRib … thank you. Because our relatives are away this year my husband and I will be enjoying Christmas dinner together dining on foods our relatives would never like or consider eating. We’re having lamb shanks, garlic mashed potatoes, yellow squash with a nice wine. The appetizer will be shrimp cocktail and dessert will be chocolate cake. A nice warm dinner with my special guy. I am spending a quiet Christmas. Family has come in. My grandson, that is in the Air Force, managed to get leave and is spending it with me. When you haven’t seen a loved one for several years, it makes it that much more special. Lots of hugs and tears when he walked into the house.i trust your recipes, haven’t had one fail me yet! Enjoy your Christmas, and God bless you. I will be spending a quiet Christmas at home with my mom, son, and fiance. I’ll be spending Christmas at home with my husband and 4 sons. This is such a busy time of year that i’m Looking forward to a little quiet time together with nothing scheduled. Merry Christmas! Thank you again for all your recipes! This Christmas, I’ll be going to church with my family in the morning and singing with the choir. Right after, we’ll head over to my in-laws to celebrate with my husband’s side of the family. What are your plans for Christmas? Won’t be a great holiday this year. Spending it on the couch, crutches nearby…..Merry Christmas! In my house, Christmas day is all about family and taking the time to recognise all those things in life that we are grateful for. In this spirit, I am truly grateful for the weekly emails I get from Karina. I appreciate that Cafe Delites takes all the hard work out of meal planning for a family of 6: Sunday – print off the recipes, Monday – food shop for the week … cooking for the rest of the week just writes itself! Merry Christmas to the team (chefs and dish tasters!) at Cafe Delites. Can’t wait to try this for New Years dinner! I will be celebrating Christmas with my dad, my sisters, and my stepmom on Christmas Eve. We go and drive around as a family looking at Christmas lights before opening up presents. I will celebrate Christmas Day with my mom, my brother and my stepdad and enjoy the extended family that shows up and watching claymation Christmas movies. I will be having an amazing day of food and love. Breakfast with my life partner then a 75 minute drive to share Xmas morning tea, cuddles and gifts with my daughter and 4 grandchildren. Then gourmet lunch at my best friends home. After lunch another drive to my parents home for dinner prepared with much love, followed by reruns of Carols where we sing unashamedly. Perfect. I’ll be driving over to my parents’ house and then going to another friends’ house in Arlington Texas, she’s French and is supposedly a fabulous cook. Nothing wrong with that! And that prime rib looks too good for words!! I will be spending Christmas with my family. We usually play games watch movies and of course eat. Pot roast, ham and fried chicken. Can’t wait. Family, food and fun. Spending Christmas with the family @ my nephew’s house with his family. As we do every year. We have Thanksgiving @ my house & Christmas @ his. Wife and I will be spending Christmas solo. I’m making braciole like my mother-in-law used to. Our Christmas celebration dinner will be on the 28th. That is when our youngest flys in from law school in NYC and the oldest is coming from Ft Lauderdale. We will be having a traditional Puerto Rican dinner of Pernil, arroz con gandules, tostones, and maduros. Also having coquito to drink and flan de Queso. All this coming from a white boy who learned to make this from my wife’s grandmother. Merry Christmas everyone. SO JUICY AND DELICIOUS!!! Can’t say enough about the texture of this. We are spending Christmas in Edmonton at the home of our eldest daughter and her family. Our other two daughters and their families will also be there. We are taking a French Toast casserole for Christmas morning breakfast. While we may not be eating prime rib the one pictured on these pages is mouth watering. It is my favourite cut of meat. Thanks for all the recipes you have posted. Spending Christmas in a cabin in the mountains of North Carolina…. This year my husband and I will be celebrating on Christmas Eve rather than Christmas day because he will be working. We will be spending the day eating lots of appetizers, eating lasagna for dinner, and then finishing the night with our traditional of watching How the Grinch Stole Christmas with hot chocolate. In the morning before he heads to work we’ll open gifts and eat cinnamon rolls. I’ll be having lunch and going to a movie with a very old friend on Christmas Day. Happy holidays! Your recipes bring joy every holiday in our home. We will be spending Christmas at home then after Christmas with extended family. Cheers to all. Spent this weekend having Christmas with my kids and family in a log cabin in the Smokey Mountains. Will be spending Christmas with my brother in another state for the first time since our parents died in 1994 & 1995. Work has not permitted this in the past. So looking forward to being with him and his family. Looks lovely, but did one last year. This year I’m doing Beef Bourguignon ala Julia Child. I am spending the holidays with my husband and kids. Making cookies and other treats. I’ll be spending Christmas Day with my sister and brother and many nephews. We are of Polish heritage and we break blessed wafers before the meal. and funny stories. We enjoy telling these stories and each of us remember them differently! Love your website, we eagerly await each new recipe you post! We will be spending a quiet Christmas in our new home with family. It will be quiet, but cozy. Thank you for your amazing recipes and Merry Christmas to you! restaurant here in town. For Christmas Day, I will make a ham, au gratin potatoes, broccoli, and cranberry relish here at my house and take the meal to her. I’ll be spending Christmas with the same family members and in the same location for the 53rd year! Wouldn’t have it any other way! Prime rib is my very favorite meat. I would’ve how to make it. It’s a whirlwind of last minute shopping and wrapping. We have an open house on Christmas Eve then stay home for Christmas and open presents and drink eggnog and have yummy finger foods. Hi Karina, I am spending my Christmas this year with my son, Christopher. This time next year he will have been graduated from high school and be in the military. 🙁 So this is his favorite roast recipe and I am happy to be making this beautiful roast along with all all his other favorite sides and dessert for him this special year together. Merry Christmas!! I will be spending Christmas with my sister and her family, missing my sweet Mother who was truly a Christmas girl! I’ll be spending Christmas with my pets, remembering my mom who was known as the “Queen of Christmas”. WE will spend Christmas at home, with family old and new. My husband and I will be spending a quiet, stress-free Christmas at home. We treat every day as Christmas, and don’t get caught up in the stresses of the season. My husband and I are in our “twilight years”. We are old enough to have grandkids, but young enough that we want to have Christmas dinner at our house. This year we celebrated early, on Sunday, with our son and his children because he works for the airport and never gets holidays off. I cooked a rib roast, but wish I had looked at your rib roast recipe beforehand, because it was woefully undercooked and I had to microwave some of it so the grandkids would eat it. It was still mooing when I took it our of the oven :). The grandkids loved their presents, and they were all exhausted by the time they left. It was a very Merry Christmas indeed! Looks amazing and going to try it as my family Christmas is over on the 23rd so will make a smaller one and hope it works out. I’m not cooking dinner for Christmas this year. But if I was – this is what I’d make! I’ll make it for my husband’s birthday in May. It looks amazing! We’ll be spending our Christmas Day dreaming of this prime rib that we’ll be cooking for family on Dec 29. Merry Christmas! Oh thank you for this recipe! My family and my husband’s family all get together to celebrate every holiday. This year Christmas is at my in laws and what’s on the menu???? Prime Rib! I’ll be making a side of baksalmaic mushrooms and onions as well as goat cheese mashed potatoes. Wishing everybody a very happy and safe holiday season. I am making this Christmas Eve this year, 2018. I am looking forward to it. This is our Christmas tradition, prime rib on the eve, turkey on Christmas day, a full compliment of appetizers New Years Eve!. Looking forward to eating it all! I love this recipe. Spending time with my new love and my kids this xmas! For Christmas dinner, I am serving Silver Palate’s Chicken Marbella, home made brioche rolls, pumpkin cobbler and my DIL is bring mashed potatoes and vegetables. Later, we will have eggnog. Mmmm is my hubby gonna love this! Making your glazed ham for Christmas Eve with the in-laws, then this prime rib for Christmas dinner with friends! Love cooking for friends and family this time of year! I will be spending time this Christmas with my hubby, our daughter, her new husband and our son. I am always trying out new recipes and many, many are from your site. My family always knows there is a new dish on the way! I love your recipes. We also moved my Mom into a memory care facility and so will all visit her. Happy Happy Everything! Oh, I can’t wait to try 🙂 I enjoy mine medium as well. Your recipes are amazing! I hope I read the email correctly =) First off, this roast looks so amazing, that as soon as I saw it, I wanted to make it!! My family and I,(Husband, two kids, two dogs, two cats, and one guinea pig), will be spending the day at home. Having a wonderful Christmas breakfast, playing with the gifts given, listening to Christmas music. Then we will take the dogs and kids out for a run at some snow covered hills. Come back and have a great Christmas dinner with ham, potatoes and green beans. I like to keep it simple because sometimes you try and do too many things and forget what the spirit of Christmas is all about. In my opinion that is!! Merry Christmas Karina!! I hope that yours is definitely merry and bright!! Spending Christmas in NH w/daughter and family. Rib roast is on the menu and using this recipe. Not sure where to make my Christmas post so give it a go here. It is always a quiet Christmas for myself, Jake and our two cats Chester and Coal My only family still alive are my two sisters in the northern part of the province We are unable to travel to them. We have a beautiful little tree and a few presents under the tree that my sister Adeline gets for us every year. She makes our Christmas Both my sisters will share pictures of their celebrations with their children and grandchildren A couple of our friends have dropped in for tea and to exchange small gifts This is the wonderful meaning of Christmas Sharing love and laughter with family and friends We are blessed Merry Christmas everyone! This looks so good! Will definitely be trying it. I’ll be spending Christmas with my husband and daughter, enjoying the day and eating way too much. We will be having a whole Prime Rib roast on Christmas. I always buy the who roast about 5 to 7 days ahead and lightly trim the excess fat, then leave it unwrapped in the refrigerator to “dry age.” After allowing it to about an hour to come close to room temp, I will follow your instructions to complete the roasting – always with a thermometer. We will have a family gathering of about 16. That’s fewer than our usual but we lost two since last Christmas and two in 2017. Making new memories while we have a wonderful meal and toast those not here. I am spending my Christmas with my husband and fixing a Prime Rib Roast! I will be spending the holidays alone this year. We will be spending Christmas at home opening gifts and eating seafood gumbo made by my mother! We always have prime rib on Christmas Eve and this sounds like a delicious way to season it. We got a good meat thermometer just for our Christmas Eve roast but of course we use it year round now. That roast looks Divine. I’m so hungry right now it’s killing me. Quiet Christmas this year as most of the family was called away on an emergency assignments. Our two sons will be here, so that makes me happy. Making this for Christmas Eve dinner for my parents! Made it last year and it’s amazing! Then Christmas day with the family! Thank you for the receipes!! We will be spending our Christmas making this dish with my husbands family! This would be perfect for our group Christmas dinner! I am spending Christmas at our home celebrating with our children and friends. We play a fun gift exchange game called the Dice Game on Christmas night with 3 other families. Makes the day extra special to be with friends and family laughing and enjoying each other. OMG that prime rib looks amazing! We’re spending Christmas at home with dear friends. Serving smoked turkey, savory bread pudding and sauteed brussel sprouts for Christmas dinner. How will I be spending Christmas? Making this for sure..
I’m making the antipasto tree this year. I know it will be a really big hit with the family! Just writing this post and thinking of the olives, sun dried tomatoes is making me salivate! I have never made Prime rib myself and this seems so easy. As my holiday menu is already set I look forward to trying this in the new year to come, however I will be spending my Christmas morning with family and your delicious fluffy cinnamon rolls!! This looks delicious! Will have to try it. This year, my parents and I are spending Christmas together, enjoying some family traditions- slow cooked ribs for Christmas Eve, attending candlelight Christmas Eve service and having shrimp and crab legs for Christmas Day dinner. We’re also going to do some local exploring. Merry Christmas! Being technologically ignorant I hope this is the right spot to tell you how we are spending the Christmas holiday. Since we don’t observe this particular holiday we will simply relax, enjoy the peaceful day and wish all those celebrating Christmas and the new year a happy and healthy 2019. Will be spending Christmas day preparing and consuming this wonderful prime rib! I am preparing a rib roast for my children and grandchildren. The highlight of Christmas for me is time spent with my loved ones. I love the excitement on the faces of the grandchildren whenever they open their presents. Merry Christmas to you and yours! This is so beautiful. I would love to be able to make it. Maybe next year. This year, my family, other than one granddaughter, have plans elsewhere. They all live out of state. So we are going to have Chinese food. That roast looks delicious, and I will attempt it one day! But it is so very important to me to keep with the tradition of a large family meal. I almost feel like old times when I start cooking on Christmas Eve! And the smells bring back those yesteryear memories! i am 55 years old and still decorate like there’s no tomorrow….It keeps me happy and young! As we sit down to eat each holiday. a prayer is lifted for all o our family that can no longer be here with us physically, but we know they are with us indeed in spirit! I’m looking for a small prime rib here in Germany (the beef isn’t very good quality here) and I’ll be having it with my wife. She has a stroke last August, 2017 and this is the first Christmas she will be at home and not in the Rehab Hospital since then. I made this last year for Christmas for my family. I’ve never made anything like it before. However it was delicious and easy. This year I would be spending making the same thing, however, I’m from Panama City where Hurricane Michael hit. Instead we are buying another home because ours was destroyed (where I can’t wait to make this again). Karina, your recipes are the best. And I have bragged to all of my friends about your cooking….my favorites besides this, thai chicken satay and your mom’s lasagna. Ridiculous! Merry Christmas! Recipe looks amazing. I will try this with my family at Christmas when we all get together along with another Cafe Delites recipe. Keep them coming. This would be a great dish to serve! My Hubby and I will be spending a quiet Christmas this year. No cooking that day. We will enjoy lunch at Katz’s Deli (they have a to-die-for Pot Roast sandwich). Then go back home and do some jigsaw puzzling. How about you? Great looking Prime Rib. Tomorrow my family will be getting together and enjoying a roast tenderloin of beef. This reminds me of this, I’m so looking forward to it! Since we are planning on having prime rib for Christmas, we’ll try this recipe to make it! Since the whole family will be home Christmas day this will be the main course! Can’t wait to try it. Will be spending this Christmas with Family and enjoying this wonderful prime rib!! Thank you. I plan to use your recipe because of all the positive comments. Wish me luck! I’m making one of these for Christmas dinner, and your recipe makes me go weak in the knees. Thanks for all the wonderful recipes this year, and thank you also for the giveaway. I will be spending Christmas with my brother this year. Roast is one of my favorite things this time of year. We call it Roast Beast! Spending the day with a bunch of brits and Australians, all of us away from home and live in Los Angeles. Merry Christmas! We have prime rib every Christmas Eve – can’t wait to try this recipe! This looks delicious! Thx for all the great recipes. We’re spending Christmas snowed in with the family at home in Idaho! Merry Christmas!! Love your recipes. I usually spend Christmas with my son and his family, two beautiful daughters 5 and 6. We will be cooking a beef tenderloin this year, very much like the Prime Rib Roast. I had no idea what to fix for Christmas, tired of the Traditional Christmas dinner, thanks for the idea. Love all of your recipies, really helps that rut I get in since I cook every day! Merry Christmas! This looks delicious! I’m so afraid to try something this expensive. This year for Christmas we are cooking a spatchcocked turkey since my family tends to show up hours early! We are also making your apple crumble which was a hit at Thanksgiving and the only desert my mom has ever liked. I’m going to try the garlic cheese brussel sprout recipe with asparagus this time. Thanks for the great recipes! This looks delicious! I will be hosting a dinner for 30 on Christmas…Roast, Ham, yorkshire pudding, roasted veggies, candied yams, and lots and lots of desserts….yum!! Christmas day has always been a family day. Spending the day with my grandsons is the best day possible! I’m trying this recipe with a 20 pounder… How long I should bake it for ? and since it’s such a big piece of meat do you have any other recommendations? When letting cooked roast rest for 20 min, do you take the foil off? Hi Devi! Yes, we take the foil off to keep the crust nice and crispy! Thank you for catching that. I will update the recipe with that information. Would you recommended marinade the roast the night before for more flavors? Vs marinade and then put it un the oven ? Please advise me if the Preheated Oven 230C if fan assisted. The Prime Rib looks amazing, your temperature says 230C please advise me is that fan assisted or conventional, as I would hate to overcook such an expensive cut meat. Wow!!! Can I just say WOW??? I never made a standing rib roast before and it turned out perfectly!! Even my mother was impressed. It was just supposed to be a practice run but I could not have asked for better. Only changes I made was that I omitted the parsley (turns out we didn’t have any), used canned chopped garlic, increased the other ingredients by 50% because I used a 8 pound roast instead of a 6 pound roast, and ended up cooking it for about 30 minutes longer than the recipe called for. Wow!!! Can I just say WOW??? I never made a standing rib roast before and it turned out perfectly!! Even my mother was impressed. It was just supposed to be a practice run but I could not have asked for better. Only change I made was that I omitted the parsley (turns out we didn’t have any), increased the other ingredients by 50% because I used a 8 pound roast instead of a 6 pound roast, and ended up cooking it for about 30 minutes longer than the recipe called for. It looks like you cut the prime rib to start. Is that the case? I will definitely be making this for Christmas! Can this be done on a gas bbq? Not a big Garlic fan….is there a substitute herb that you could recommend to replace garlic ?? How about for a boneless prime rib? And does a larger roast take longer? Do you set your oven to “bake” or “broil” to roast this prime rib? How’s about preheating the oven since “bake” is the only option for preheating? I made a 8.5 lb Prime Rib Roast from this recipe and it was amazing!!! I was a little concerned about the cook time, but I came out perfect for our liking. I cooked it an additional 25 mins, and it came out Med – Med Well which was perfect for my family. The seasonings were great! The only thing I did differently was I added more butter to the season mix and injected it throughout the prime rib. The meat was so tender and juicy. It was so good that I want to cook another one. 🙂 Thanks for sharing! Made this prime rib roast recipe for New Years Eve and WOW it was unbelievable my guests said it was better than from a fine restaurant . Thank you Karina this recipe is a keeper and the only one that I will use in the future! Blessings to you and a healthy future always. Absolutely a fantastic recipe, only thing I did different was to cook on the bbq at 450F indirect heat not covered and used a meat thermometer. Took 1 hour and 20 minutes and only opened the lid once. So crispy I had so many great comments for our new year eve dinner, but the comments need to go to Karina for creating a fabulous recipe. Is the ‘covered with foil’ to be done loosely? or wrapped tight to the meat?.. Hi Michael. I cover the pan with foil and seal it really around the pan tightly. It doesn’t need to be wrapped around the meat, so long as it’s wrapped around the pan itself, the meat will continue to cook as it rests. Every year my two girls and I try to make many new dishes for us and our family. We try to make new traditions for our family. This is by far the best recipe for prime rib I’ve come across. We are making it again this year since everyone is still racing about it at home. Thanks Karina! You’re welcome Rene! I hope it turns out well for you! OMG that’s the most beautiful looking rib and looks so juicy! This looks wonderful. Now that my grandchildren are older they pick the menu and cook with me. This year we are having a crown roast of pork with roasted vegetables, mac and cheese, homemade bread,simple appetizers and chocolate cate with strawberries for desert.